Leading Manufacturer of leak test apparatus and digital automatic leak test apparatus from Chennai. Leak Test Machineis an ideal instrument to check the sealing integrity of blister packs, strip packs, sachet and pouch packs etc. 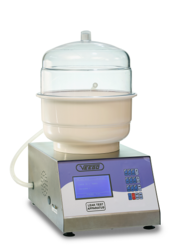 Set vacuum upto 600 mmHg. Display Indicates Set and Actual VACUUM LEVEL. Settable, Start delay Time and Vacuum Hold Time. Automatic Release of Vacuum Pressure. Wide angle alphanumeric display panel. Equipped with Hold Time cycle and Retention Time cycle. The test can be conducted for a set vacuum of upto 600 mmHg. We are a leading manufacturer ofDigital Automatic Leak Test Apparatus Model Vlt-adv. PS-2 computer keyboard for data entry. Result outcome with the signature of authorization. Facility to Validate vacuum level. 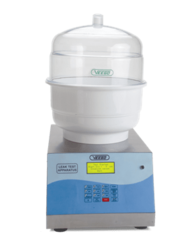 The instrument is supplied with standard 12 inches diameter desiccator. 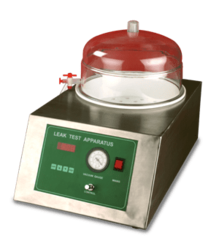 Looking for LEAK TEST APPARATUS ?